Chronic understaffing of nurses is continuing to put patients at risk, a survey has revealed. The immense pressure on nursing has not improved in a year, according to Unison’s sixth annual poll of UK nurses. The Ratios Not Rationing survey, published to coincide with the start of Unison's health conference, highlights that two thirds of the 2,704 people who completed the poll reported unsafe wards. Some 63% of respondents say wards are so understaffed that nurses cannot ensure safe, dignified and compassionate care. The poor patient-to-nurse ratio is worst on wards for the acutely ill or injured. On these wards, more than two in five nurses care for eight or more people. Unison head of health Christina McAnea called on the government to introduce minimum nurse-to-patient ratios. ‘Too few staff are still looking after too many patients, especially on wards where people are seriously ill. This is putting lives at risk,’ she said. She added: ‘It’s yet another worrying example of the pressures facing the NHS. Safe staffing should be a priority issue in the coming general election campaign. The findings are based on responses to an online questionnaire completed by nurses on 7 February. Nearly two-thirds of respondents said they are so busy they have no time at all, or are rushed when trying to comfort or talk to patients and relatives. Half said they must work through their breaks to make up for staff shortages and four in ten said they work more than their contracted hours. 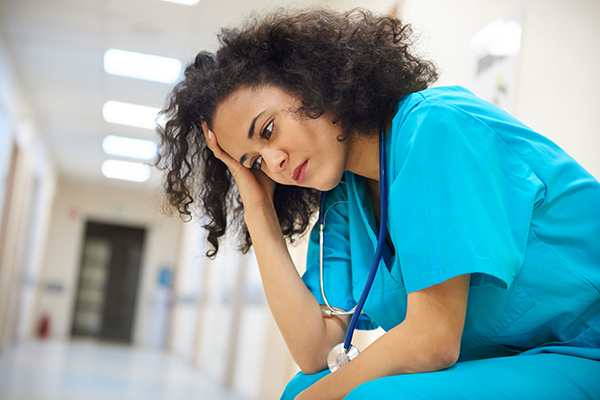 More than half of respondents said they would leave their jobs if they could – and one in ten said they want to leave nursing altogether. Unison believes that, if staff-to-patient ratios are improved, recruitment and retention levels in nursing would improve too.